The Diamond Dove is one of the smallest doves and is considered to be one of the most beautiful! The little Diamond Dove is very popular, second only to the larger Ringneck Dove. It is a most delightful and attractive pet with beautiful white spots or "diamonds' on its wings and shoulders. It is a perfect choice for a beginner as it is very hardy and easy to keep. It will readily breed and makes an excellent foster parent for the young of other small dove species. In the wild the Diamond Dove is quite prolific, but it is so extensively bred and readily available in captivity that it is generally considered to be a domestic dove. Guide to a Happy, Healthy Doves & Pigeons. Distribution: The Diamond Dove is found in central and northern Australia. They are members of a group commonly called the Turtle Doves. They inhabit open terrain, grasslands and sparsely wooded areas especially around water. They are also found in the parks and gardens of cities and towns. Description: The Diamond Dove is a small bird, a little larger than a canary, with a long tail. Mature birds are about 7 1/2 inches (19 cm) long and will weigh about 1 1/2 oz (45 g). Their average life span is about 10 years. The head, breast, and neck are a light bluish-gray and the back is a light brown. The tail is a dark gray with the middle feathers tipped in black and the outer feathers tipped in white. The lower abdomen and under the tail are a creamy-white. The upper half of the wings and the shoulders are a brownish-gray scattered about with small white spots circled in black, thus the 'diamond' appearance. The lower half of the wing is a more chestnut color. The eye is orange-red surrounded by a coral-red orbital eye ring. The beak is olive brown and the legs are a pale pink. The male will have a darker head, neck, and breast than the female and the orbital eye ring will be larger, though these characteristics are not readily apparent until they are at least 6 months old. A young bird will have a browner head and overall feathering, and the eye and surrounding orbital ring will be paler. There are several mutations and color varieties of Diamond Doves with the most popular being silver. Others include varieties that are all white, dark gray, very brown, red, yellow, cinnamon, and pied. Care and feeding: Diamond Doves are usually kept in an aviary, but they can also easily be kept in a large parakeet cage with 3/8" bar spacing. The minimum size of the cage should be at least 18" square. Cages that are longer and wider are more important than tall cages as these birds flutter around and do not climb. Like the Ringneck Dove they are quite hardy. If they are kept outdoors and are accustomed to cold weather, they can take below freezing temperatures for a couple of days, but it is best to provide a heat source. A good finch or parakeet seed mix supplemented with greens rich in minerals, vitamins, and calcium is a fine diet. They not only enjoy their greens but will also enjoy spray millet, especially white millet. They also require grit and cuttlebone. See About Doves & Pigeons: Housing and About Doves & Pigeons: Care and Feeding for more information. Social Behaviors: They are good-natured social creatures that do well when kept in cages or in aviaries. Being very peaceful and tolerant, they can be housed kept with finches and canaries. They form permanent pairs and mates do well if kept together. See About Doves & Pigeons: Social Behaviors for more information on social behaviors of doves and pigeons. The Diamond Dove gets its exercise through short flights about the aviary. If kept in a cage, the larger the better so they can get some exercise there too. Breeding/Reproduction: These are one of the doves that is dimorphic, meaning it can be sexed visually. It generally takes several together in order to tell the difference between the male and female, but the male will have a noticeably larger orange ring circling the eye. This difference, however, does not become apparent until they are about 6 months old so younger birds will be difficult to determine. Though Diamond Doves are not as prolific as the Ringnecks, they will breed in either a large cage or an aviary. They will need a nest, an open canary nest will work fine. Provide nesting materials such as dried grass and small twigs. They female will lay two eggs which will hatch in 13 - 14 days. Be sure to remove the young when they are weaned as the parents may start attacking them in an attempt to run them off. They do make very good foster parents for the young of other similar sized doves. See About Doves & Pigeons: Breeding/Reproduction for more information on breeding. The Diamond Dove is not normally handled as it is a bit more flighty and high-strung than the Ringneck Dove. It is usually kept in an aviary but can also be kept in a cage as long as there is a quiet atmosphere with few disturbances. Being very peaceful and tolerant, they can be kept with finches and canaries. See About Doves & Pigeons: Potential Problems for information on health. Hy. I m Shahrukh. I have a pair of daimond doves about 6 month but they are not laying eggs . They start crossing about 5 month ago, bit not laying eggs. Can you tell me why they are not laying eggs? What are the Diamond Dove threats? I am doing it for my project and I need some help with this questions. Please! I still need help, I'm getting her in two weeks! 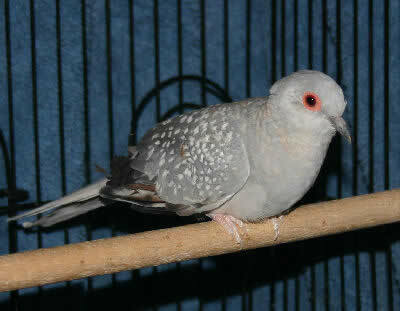 I need a male diamond dove. Please text me 318-715-4656. I am in Alexandria, Louisiana. I am looking for a young Diamond dove does anyone know where I can get a young one I have two weeks to find one or I have to go to the store and get an adult.